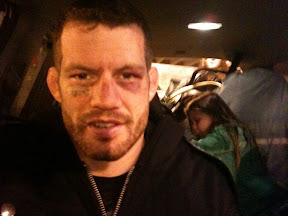 Nate Marquardt: God is good! I just arrived home and my wife and two little girls greeted me inside the airport with a welcome home poster! I have to say, I'm heart broken over this loss but I have to put my trust in God. I really felt at the end of the fight that I had won. I thought I won rounds 2 & 3 and the first was close. I felt I did more damaging shots and had more takedowns. I knew the fight was close but I felt I won at least 2 rounds. His punches would tap me and score points, but nothing rocked me. I rocked Okami several tines though. I should have pushes forward a bit more throughout and especially round three. All I can say is I did my best yesterday and I will improve from here. I'm still top of the division and top of the world ranking. I'm going to rest now and take a step back, then I'll come back and figure out what I can do. I will be champion one day. This is just a small step back.